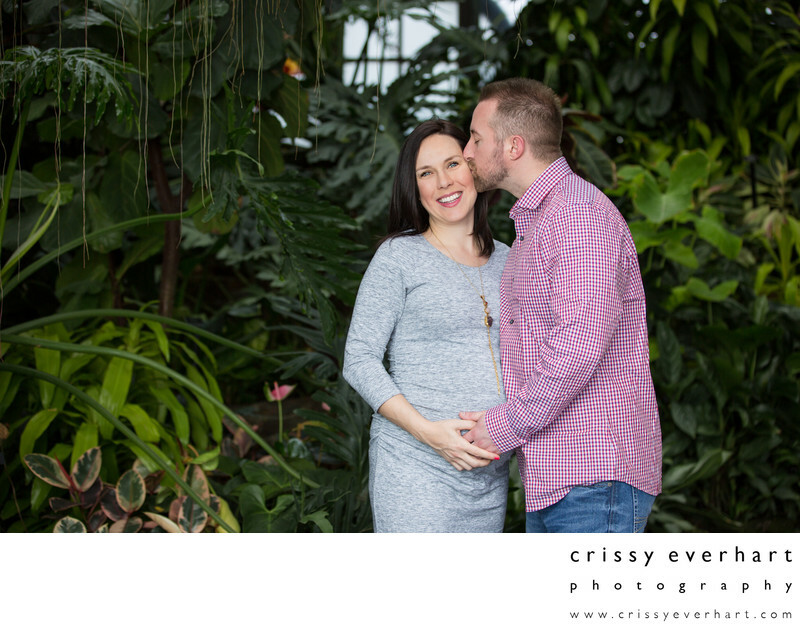 This soon to be mom and dad are photographed in Kennett Square's unique Longwood Gardens, which offers amazing floral displays all year round in their conservatory. This image is in a tropical room, and different shades of tropical plants are behind this couple. A single pink lily is in the background, which works perfectly because this couple is expecting a baby girl! Mom wears a grey cotton dress with three quarter sleeves and a ruched belly. Dad wears a red and white striped shirt and jeans and kisses his love on her cheek as she smiles, looking at the camera with her stunning blue eyes and fabulous smile! They hold hands right over her big belly, and snuggle close. Greenery is all around them, and small vines hang down to the left of the image. A single window is partially visible in the background, the couple is lit with my off camera speedlight in a soft box.